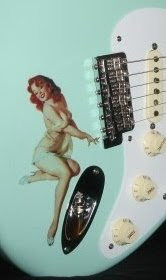 John Fisher's web documentary "How to build a Stratocaster Style Guitar- The Hard Way" is a real nuts and bolts- from scratch, illustrated adventure. The handful of frets photo pretty much symbolizes the extent of this guy's extreme DIY process. To describe it even further, Fisher's attitude and viewpoint, expressed throughout, in some ways turns the project into a metaphor of how to live your life. Each page and section of the project includes inspirational quotes to sort of coach you through the difficulties and learning curves of the experience. Even if you have no intention of building your own Strat, much less from scratch, Fisher's "Chicken Soup for the Guitar Builder" commentary style is sure to provide enlightenment as well as technical insights. You get the idea that this guy could easily improvise through a Tom Hanks "Cast Away" survival situation. "A human being should be able to change a diaper, plan an invasion, butcher a hog, steer a ship, design a building, write a sonnet, balance accounts, build a wall, set a bone, comfort the dying, take orders, give orders, cooperate, act alone, pitch manure, solve equations, analyze a new problem, program a computer, cook a tasty meal, fight efficiently, die gallantly. Specialization is for insects." What if you could blog about each of those things? Does that count?